Great company! They donated bags to help with food delivery at the non-profit I work with! Great company to do business with. Happy I found out about them. Affordable prices and eco-friendly products. Bought some of these non-woven bags to bring to my workshop. These heavy duty bags are very sturdy. I will be sure to place another order with Custom Earth Promos in the future. Strongly encourage you to use this company! My company bought these eco-friendly affordable bags and were very satisfied with the order. Our customers were interested in the product as well! Thanks. I love the design of these bags. I bring this bag almost everywhere I go. The two strips on the bag are a nice design. The bags are very affordable as well. I loved the design of the bags as soon as I saw them. I placed an enormous order because I needed the bags for an upcoming workshop. Very affordable price for all! Thanks CEP. These bags came out just the way my company and I was planning on. We brought them to our most recent convention and they were a big time seller. Nothing but positive comments from my company and I.
I ordered these bags as part of a company giveaway and they were definitely the main attraction! Will definitely reorder from Custom Earth Promos again. My company ordered these bags for our annual giveaway and we, as well as our customers, were not disappointed. 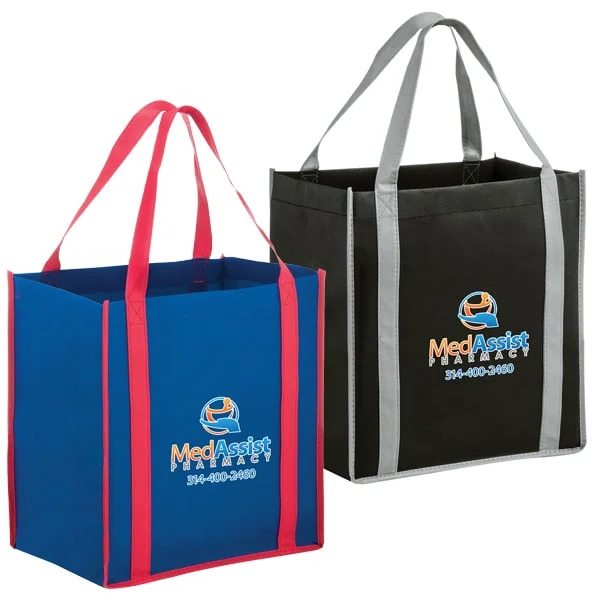 The two-tone color scheme of this bag served to highlight our logo perfectly! These bags came out perfect, Such an amazing way to promote! My clients love these bags, I've seen them in the food store on multiple occasion! SO happy. Just received our bags they came out great! Cant wait to hand these out at our next event. Was very pleased with the outcome of my order. I was so pleased with the customer service and my bags came out even better than expected. Thank you, Custom Earth Promos! We increased the material density for our order and could not be happier. Very high quality. This is such a great product. The long handles are perfect for my clients. We added zippers to our bag and are obsessed! The color combinations of this bag really offer a bold, eye catching look! Absolutely perfect! I love that these bags are stylish yet affordable! Over the moon with our bags! Attractive and affordable! Having these bags in hand makes me overly happy. The quality is wonderful and they are eco-friendly too. Thanks Custom Earth Promos for all your hard work. Love this bag! It's a client favorite!